The historical novelist’s life is a lonely one. We spend our days at our desks, arguing with computer screens, wrestling with words, engulfed by books and files, and holding conversations with characters who never existed or who have been dead for a thousand years. Is it any wonder that, when given the chance, we throw ourselves a party? 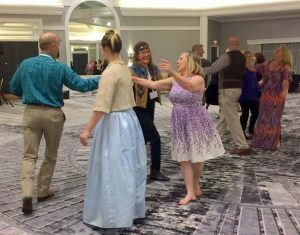 That’s what happened last week when 400 plus members of the Historical Novel Society convened in Portland for a conference. Well, we call it a conference, and in fact there are panels about writing and publishing and history, but in between the panels and the pitches there are dinners and lunches and drinking and, well, it’s a 3-day long party. And a very big party, with writers, readers, agents, editors and booksellers in one place, frequently all of them talking at once. There was the welcome cocktail costume party, where attendees were invited to come in fancy dress and many did! Medieval kings and queens, 18th century militia, Roman goddesses, ladies in exquisite gowns from a myriad of centuries and men in elegant garb complete with hats and spats or boots and neck-cloths when called for. 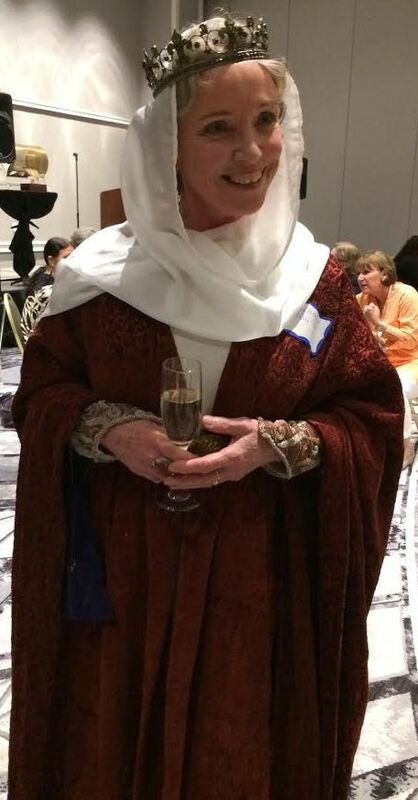 I must confess that I was absolutely smitten by Susan Shay as Eleanor of Aquitaine, and once I’d followed her about and finally snapped her photo I was so thrilled I didn’t even attempt to corner anyone else. Happily, other people did! How Well Does Your Dialogue Work? On Friday I led an intimate session, billed as a Koffee Klatch but, alas, without coffee and cakes, on ENGLAND BEFORE THE CONQUEST, which went in an altogether different direction than I had imagined it would, which was actually delightful. Our little group of 18 was much less bloodthirsty than I had anticipated. Not much talk of swords and warriors despite our collective fascination with events in England during the Viking Ages. We discussed things like the marriages of æthelings, and touched on Alfred and Æthelred, and considered the role of Anglo-Saxon queens, especially Emma. The Brits in the room informed me that TIME TEAM is available on YouTube, and I gave a shout out to the group about THE BRITISH HISTORY PODCAST. (I’ve just watched the very first, 1994, episode of TIME TEAM, The Guerilla Base of the King. It’s all about the fort at Athelney where Alfred the Great spent a winter hiding out in 878; that’s exactly the historical event currently under discussion at THE BRITISH HISTORY PODCAST – Alfred’s guerilla war against the Danes. So, how’s that for synchronicity?) 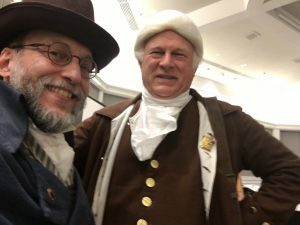 The hour flew by and, like a fool, I took no pictures and did not even turn on my bloody phone/recorder so I could provide a more in-depth report in this post. Bother. The following day was Saturday, and we did it all again. 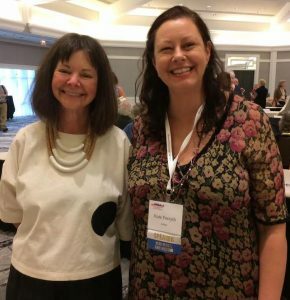 I was on a panel titled PUTTING THE HER IN HISTORY which was the brainstorm of author Stephanie Lehmann, who moderated. Co-panelists were Rebecca Kanner, Mary Sharratt, and Nicole Evelina. And although there are no recordings, I can tell you that my fellow panelists were passionate and eloquent about the roles of women throughout history, about the definition of POWER, and the difficulties that historical novelists face in bringing all-but-forgotten women to life. The conference board always arranges for special guest speakers and this year was no exception. I don’t know that we’ve ever had a Pulitzer Prize winner speak to us before, but this year we did. Geraldine Brooks won the Pulitzer Prize in 2006 for her novel MARCH. She has also written the best sellers YEAR OF WONDERS, PEOPLE OF THE BOOK, and most recently, THE SECRET CHORD. I have read and loved all of these. She is a marvelous writer, an inspiring speaker, and her stories about her pre-novelist life as a journalist in war zones like Bosnia and the Middle East were hair-raising. David Ebershoff spoke on the second day. He is the author of THE DANISH GIRL (I highly recommend it) as well as THE 19TH WIFE which I have not read yet, but I’m told it’s remarkable. It was utterly fascinating to hear him speak about Lili Elbe and her life. And it was incredibly moving to hear him describe his return to Dresden to visit her grave after the making of the film THE DANISH GIRL. In between and after the sessions and during the meals there were conversations among old friends, among friends who knew each other only from their head shots on Facebook, and among friends newly made; there were visits to Powell’s Bookstore; there was laughter, and camaraderie, shared stories about the publishing world and the writer’s life. 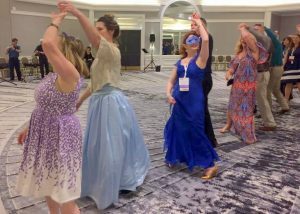 The final event of the conference was A REGENCY MASQUERADE BALL. A wonderful trio of musicians accompanied our dance master as he led us through the steps of English Country Dances. The musicians were extraordinary, and it was such a treat to be able to dance to live Regency music. Off to one side of the ballroom a group from the Jane Austen Society taught the card sharks among us how to play Whist. 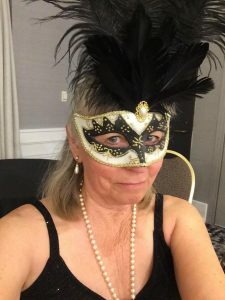 Domino masks were handed out at the door, but I brought my own, and I have to say, it made me feel both elegant and mysterious as I danced the night away. Next year the party moves to Scotland! 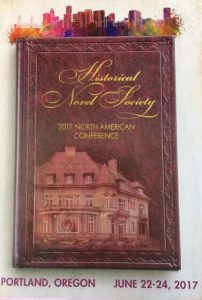 This entry was posted in Events and tagged historical novelists, HNS Conference 2017, Medieval. Bookmark the permalink. Great post, Pat! It must have been wonderful to dance to live music. Hopefully see you there next U.S. session.